With the reach of social media, it’s much easier to discover new makeup brands. Wether they are small indie brands or bigger brands that you’ve just never come across. It’s now easier than ever to make new discoveries. There are of course many popular, easily accessible brands that I haven’t yet tried, like Natasha Denona or Viseart. I do however think that there is something special about purchasing from a small independent company that’s working to create quality products. I first heard about this company from Tina aka The Fancy Face. I seem to discover quite a few new brands from her. In one of her videos she mentioned the extensive colour range of eyeshadows that the brand as, along with their stellar quality and outstanding customer service. I’ve been following the brand on Instagram for a couple of months now and have seen for myself the range of products they carry. I’m interested in trying out their cream eyeshadows as well as their single pan eyeshadows. I actually came across this brand because of a post I saw on the reddit makeup addiction site. They’re an international company based in Germany but they do ship to Canada and the US, which is nice because too often brands located in Europe don’t ship to me. They carry a range of liquid lipsticks as well as eyeshadows. Obviously I’m just interested in the eyeshadows. The shade selection isn’t extensive right now, but they are a new company so I’m certain that it will grow in time. From reviews that I’ve read and seen it seems that the quality is there though. This brand was also another reddit discovery. Someone had mentioned wanting an all duo chrome eyeshadow palette and this brand was suggested. Having a love for duo chrome eyeshadows I couldn’t help but check out the brand. They are from Italy and remind me a bit of the brand Nabla, and not just because they’re both based out of Italy. They have a couple different palettes as well as single eyeshadows and blushes. Unfortunately they don’t currently ship outside of the EU (European Union). This company isn’t new to me, but I’ve never ordered from them before. This past year they branched out and started selling pressed eyeshadows along with their loose ones. I’ve heard that they have great duo chrome shades. The overall shade selection is good, with a wide range offered. The pricing isn’t too much and it’s located in the states so there’s no worry about shipping to Canada. I recently discovered this brand from a Youtube video where their new rainbow palette was being discussed. Since I’m always in the market for a new colourful eyeshadow palette I was very interested. 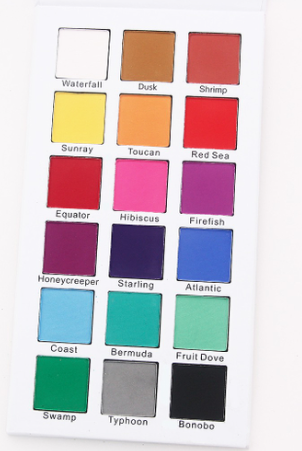 The palette looks well thought out and runs the full colour spectrum, it contains 18 eyeshadows, with a few muted shades that can be used to blend and soften the more vibrant shades in the palette . They also have a few other smaller palettes, that look nice as well. They do ship internationally, yay! With the many beauty companies that are producing new and interesting products each month, and what seems like every week, which companies are you interested in trying out?